COMBATSIM.COM enters the 21st century with its first video review. The subject of this review is Thrustmaster’s T.Flight HOTAS 4, Ace Combat 7: Skies Unknown Edition. Check it out on our new Combatsim YouTube channel. After the oddity that was its GeForce 419.67 WHQL Creator Ready drivers, NVIDIA launched new GeForce drivers with the same 419.67 version number, but with “Game Ready” branding. It’s now clear that Creator Ready is a fork of the GeForce software, released at a slightly lesser frequency, targeting creativity and productivity software that don’t quite need Quadro feature-set or certifications. GeForce 419.67 WHQL Game Ready, on the other hand, add day-one optimization for “Battlefield V: Firestorm,” a new update that brings the highly addictive Battle Royale gameplay mode to the Battlefield franchise. Optimization is also added or refined for “Anthem,” “Shadow of the Tomb Raider,” and “Sekiro: Shadows Die Twice.” NVIDIA expanded the list of Adaptive Sync monitors that are now capable of G-Sync. Among the bugs fixed are a performance drop noticed in DaVinci Resolve, overexposed brightness and color seen in “Far Cry: New Dawn” with HDR turned on; performance issues with “Total War: Warhammer 2″ with AA turned on; artifacts seen in certain Adobe applications; screen corruption when switching display modes with HDR turned on in “Apex Legends,” FOV reduction when recording with GeForce Experience; flickering noticed in “Star Citizen” followed by a CTD on “Turing” GPUs, abnormal time taken on GeForce GTX 980 responding to NVAPI calls; TITAN RTX overheating when enabling TCC mode via NVLink; and second monitor flickering with two monitors connected to an RTX 2070. You can download the new GeForce 419.67 WHQL Game Ready drivers through GeForce Experience or via GeForce.com. AMD has released the latest version of their Radeon Adrenalin 2019 Drivers with beta version 19.3.3. This release adds support for Sekiro: Shadows Die Twice and Generation Zero. In regards to performance improvements AMD made no mention of any with this release; however, a few fixes were implemented. Up first is Rainbow Six Siege which should no longer have texture flickering or intermittent corruption issues. Meanwhile, in DOTA 2 VR AMD has managed to eliminate stutter problems on HMD devices when the game is utilizing the Vulkan API. They also made mention of two known issues as well. The first issue impacts AMD Ryzen mobile processors with Radeon Vega Graphics, on which the mouse cursor can disappear or go beyond the top boundary of a display. While the second problem pertains to WattMan gauges along with the performance metrics, overlay being inaccurate on systems with an AMD Radeon VII installed. The new Radeon Software Adrenalin 2019 Edition 19.3.3 beta drivers are available online at the AMD driver download page. You can download the new GeForce 419.67 Creator Ready drivers at GeForce.com. These days, it seems that a lot of our focus that goes into new products is centered around bright lights and RGBs. While this is fine for those who love the puking rainbow scene, there are those who still prefer the stealthy subtle build over former. In this review, we’ll be diving in to the Cooler Master MasterBox NR600 which is perfect for those who prefer subtle stealth over the RGB rainbow. 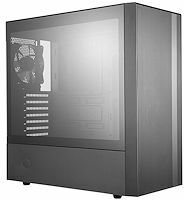 The NR600 is part of the MasterBox series of mid-tower cases that features clean crisp edges, plenty of cooling options, and of course a tempered glass side panel.